Big News: WAXWORK To Be Rebooted - Info Within! A Horror classic that often slips through the cracks is something that is fun to stumble upon every now and then. 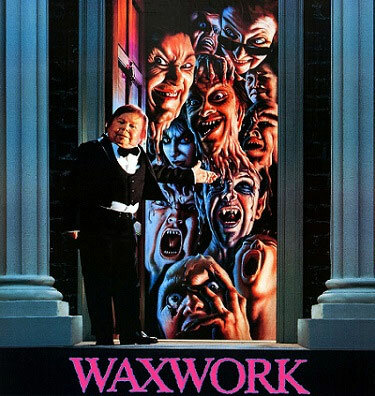 One such film that doesn't get the due that it truly deserves is Anthony Hickox's 1988 movie WAXWORK. It told the story of how a wax museum owner releases evil by way of his wax figures which offered a lot of possibilities and fun for us as an audience. “Right now we’re working on a couple of other horror projects. One of them is a reboot of the ‘80s classic Waxwork,” said Kessner. 1988's WAXWORK starred Zach Galligan, Deborah Foreman, Michelle Johnson, Dana Ashbrook, and David Warner. "Inside the wax museum, a group of teenagers are aghast at the hauntingly lifelike wax displays of Dracula, the Wolfman, the Mummy, and other charter members of the horror Hall of Fame. Eash display is perfectly grotesque, yet each is missing one thing... a victim! Admission to the Waxwork was free, but now they may pay with their lives! One by one, the students are drawn into the settings as objects of the blood-thirsty creatures. They are now part of the permanent collection." We will continue to follow the WAXWORK reboot as it unfolds.